There is more deliciousness in Tropical North Queensland than you can shake a sugar cane stick at, which is why there’s a reason it’s been dubbed the ‘Northern food bowl of Australia’. With a proximity closer to South East Asia than to Sydney, there’s also a treasure chest of wild, weird and wonderful flavours that are everyday delights for locals and exotic wonders for visitors. Here are five delectable treats that are locally owned and grown in TNQ (and that any local will certainly have on their ‘last meal’ list). Coconuts and tropics go hand in hand, and coconuts are the cool-food-kid on the block right now, and they’re healthy(ish), so that’s a perfectly good reason to scoff these nutty treats by the handful. Winners of Delicious Magazine’s Produce Awards, these chips are made from organically grown coconuts that are handpicked and harvested directly from the beaches of tropical North Queensland, dried and seasoned to a variety of sweet and savoury flavours. Make sure you try the Sea Salt & Caramel coconut chips, and for the more spicy inclined, the Sweet Chilli is hot hot hot! For many people, hot sauce is more than a mere condiment – it’s practically a way of life. Not only does it make food taste awesome, but it’s actually really good for you too, so the scientists say. That’s right – pounding half a dozen Habaneros comes with added health benefits! Fortunately, you don’t have to look any further than this tropical backyard with Fangs n Chilli Sauce. Made in Cairns using local ingredients, it tastes even better knowing every bite is doing good. And blows yer socks off. You think Queensland, you think sugar cane, you think pirates and rum, right? No? Just us? Don’t be shy – Queensland has certainly come leaps and bounds since rum was promoted by polar bears, and Mt Uncle Distillery – located at the foothills of a banana plantation outside of Mareeba on the Atherton Tablelands – is proof (proof? Alcohol proof? See what we did there? No? Okay, I’ll stop now…). 4 years barrel aged, no added caramel, fermented using locally sourced sugarcane syrup, this rum is designed for sipping on ice and will put hairs on ye hearty chest! Righto. So these are less a product you can buy in a store, but more local delicacies that need to be on your gastronomic bucket list. 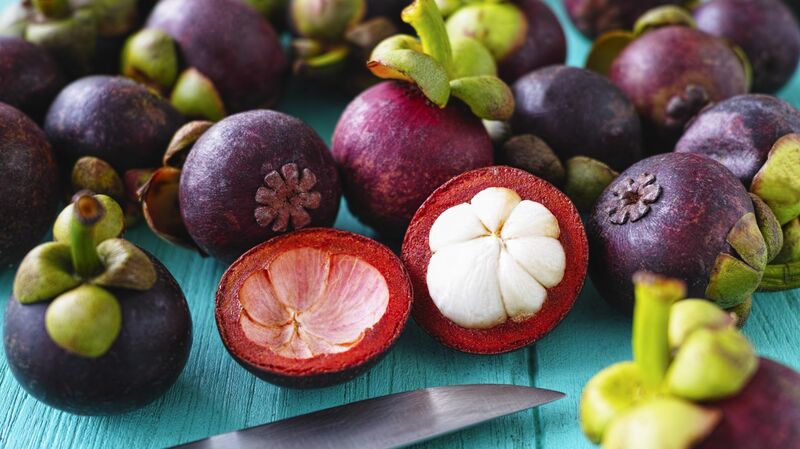 Mangosteens are so famously delicious that they’ve been proclaimed the ‘Queen of Fruits’. If you haven’t had a mangosteen before, you haven’t tasted the most delicious thing to ever grace our beautiful planet – lemonade-y, slightly lychee-ish, it’s a flavour that makes your taste buds sing. In season for only a short 6 weeks, these beauties are well worth planning holidays around. Available from any good hawker market, like the famous Cairns Rusty’s Markets.